The Decorators are conversation sparkers - despite the name. “We’re not just going to come in and make things pretty,” co-founder Suzanne O’Connell assures us. Rather, their skill comes in framing a place to yield bountiful discussion. A multi-disciplinary design collective, The Decorators skillfully pick up tools from landscape architecture, psychology, spatial and social design - designing public interventions that get people talking, often in areas of regeneration where the dialogue is needed most. We meet Suzanne - a landscape architect by trade - at London's Dalston Curve Garden, a pocket park studded with fiery flowers. Peaceful yet packed with people, it’s a place for respite, conversation, and a testament to what can be created when the community takes hold of a city space. All are important to The Decorators, and she’s quick to stress the value of human interaction in the projects they create; between those experiencing the ‘Hackney Circle’ social project for over-60s; or the customers at Ridley’s, the temporary restaurant project, where exchanging food-for-cooking levelled roles and created a space that governed the social currency within. Conversation is the core of any intervention by The Decorators. So we get talking, eager to discover how they go about engaging communities. Where did the concept for The Decorators come from? The first project that made a name for us was Ridley’s at Ridley Road Market. It established us within the public realm and it became a kind of public signifier that we existed. It also introduced us to the Greater London Authority (GLA) and other practitioners. Understanding the different types of practice needed is very important in public space. It’s an intersection between design and form and structure - and programming as well. For example we have Carolina, who’s a psychologist, in our team who thinks about the social dynamics and the psychology of space. And why did you choose the name? It was a play on the word ‘decorators’. What we found interesting about the name is that decoration is usually seen as a minor form of spatial design, just like the temporary is seen as second to architecture. Also the figure of the architect still remains very distant from the general public, whereas the decorator is somehow more accessible, more able to work on the ground. You could think of decoration as superfluous and static, but actually we think it's quite an important tool to frame things and tell a story. You mentioned that psychology is an important consideration for you - how does that influence the way you work? We don't necessarily say, “This is the psychological approach for this project.” It’s more an underlying essence. If I had chosen another career, I would have been a psychologist. Everything I read has to do with who we are as humans and how we relate. I’m also interested in how we might explore therapy, looking at people’s narratives. I’m interested in people, really! It’s also about finding out what people need in order to respond, and that’s constantly in flux - like identity. We have identities as individuals, but identity is also related to place; how do you start to uncover that? Psychologists are quite good in terms of the individual, but actually I'd like to know more about those collective identities. Is there something that you frequently use as a trigger to get people to respond - a conversation-starter, if you like? With all of our projects, we play with ideas around the Trojan Horse: we’re always looking for that framing narrative that invites people in. It’s not just about saying, "Come here to talk about deep and meaningful things in your life.” It’s about considering the medium of exchange. Why are people giving you their time? Why are you having a conversation? It's an exchange, not just taking. Then you can start lots of different conversations. 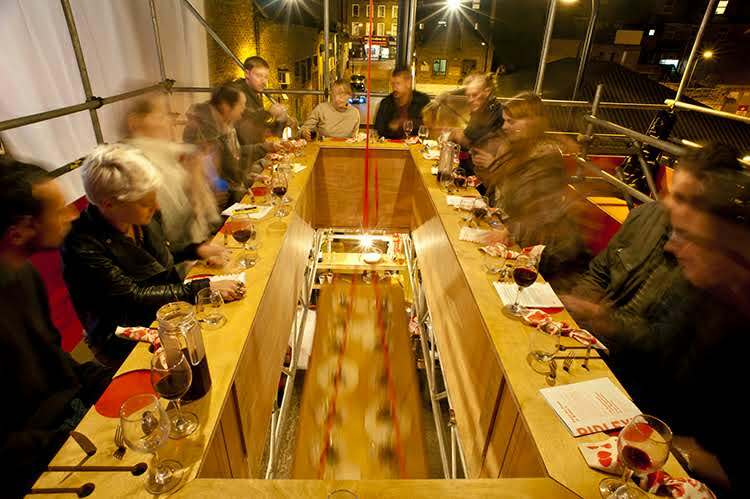 On our Ridley’s temporary restaurant project, for example, the act of the restaurant itself brings people in. You were a supplier or a customer or a chef, but that’s your medium of exchange. The restaurant was a way to frame conversations, the same way you might use the medium of radio as a way to frame conversations. So rather than one cookie-cutter approach to break the ice, it’s about drawing people in. Exactly. The key question is, what's the ‘care base’? What do you care about? What does each person from each different layer of that place or community care about? You don't want to just be talking to the usual suspects. How do you get down further? The answer is time. Every project means embedding yourself: listening, listening, listening, looking and then finding your way in. We have to make a case for each project, with each commissioner, that this is going to take time for us to find our angle. The actual installation at the end might be temporary, but the relationships have taken a lot of time. I think our work plays between the two: temporary and long-lasting. It might seem easily dismissed, but the moment of the installation is valuable too. Sometimes we’re working on a temporary project, but we do a lot of work before then, because we want there to be a legacy. The traces of a project might be a restaurant, or it might have a yearly life cycle. Our research is through embodiment. It might be on a short timescale, but it’s moving things forward and sparking new ideas. Our work is also about how to feel all that research: how can we step in? You need to make sure there is authenticity in every moment that you are creating. Tell us about one of your projects as a way of outlining your process. In Erith, we were commissioned to look at the town centre and devise proposals for the kinds of projects that could bring back activity to Erith’s riverfront. There was a feeling that the town centre could be doing better. We interviewed around 30 people, and worked with DKCM to do a spatial analysis. Then we did a feasibility report on what types of projects could help achieve different aims that Bexley Council had: elevating Erith as culturally rich place and creating new spaces for people to interact, as well as creating a bit of a night-time economy. We came up with 24 proposals - but the one that seemed to encompass all of our ideas was the Erith Lighthouse, a temporary restaurant and monument for Erith town centre. The project is about using food to anchor community activity by the river by creating a narrative that reconnects the town to the river and its forgotten agricultural heritage. We've been reaching out to lots of different partners - suppliers, chefs, council partners, cultural partners - within the wider London area. Now we have to deliver in the coming months. It's a lot of work but is really exciting! A lot of your projects not only touch on regeneration but encourage social integration as well as conversation – The Hackney Circle is one example that comes to mind. How important is that? I think it comes back to that idea that we are just really interested - in people, in how they behave in space, in what makes place. If we were just going around doing ‘regeneration projects’ on places, it would be boring. So if the agenda of a council is about regeneration - well then, what’s the agenda of the community and the people who live there? We also want to know that. Balancing those agendas is one thing that we’re trying to figure out. As we grow in confidence as practitioners, we try to work with the developers who are trying to do a good job where there is a sense of respect for everyone's role in the project. Often, there are these negative relationships that have developed between council, community and developers. But when you consider it, what are the intentions of everyone involved? Probably pretty positive. We try to find that sweet point that seems to make sense for everyone. Then co-ownership becomes part of it naturally. It also comes back to integrity and authenticity. What’s the agenda? Who is it for and why are they doing this? Do the participants know why they are taking part, or is it just marketing? Navigating the relationships with developers and councils is a very time-consuming thing. But reflecting on "Where is this going? What are we doing?" through so many meetings, you realise that the relationship comes out at the end. What advice would you give to other placemakers trying to negotiate this? Realising that everyone has good intentions, and trying to help people get over those ‘old brain’ initial reactions. With developers, try to step back and create that democratic space where everyone is able to listen to each other. It’s reminding people, reminding yourself as a mantra: step back and breathe. We are not in conflict with each other. What have been your most successful projects, and why? Our Hackney Circle project had loads of good ingredients, and it has a legacy, which is great. We interrogated the brief, which originally was about designing add-ons to the furniture in the public square, and we thought, "Well, no, actually it's about the relationships between people and that square, not just the furniture." The partnerships we created with the different businesses on Dalston Square worked really well to create welcoming front doors for residents who had previously discounted those spaces as somewhere they could go. That project also raised a lot of questions that we're now continuing with a project called Public Age in Dublin. But it also comes down to good clients. 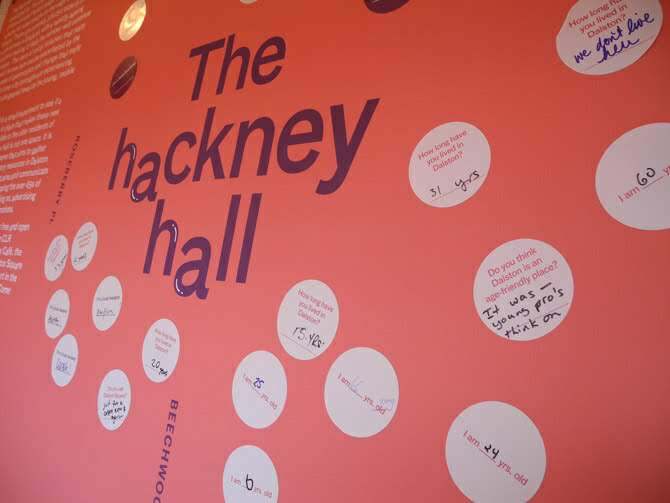 Lucy McMenemy, the cultural officer at Hackney Council who commissioned The Hackney Circle, was an amazing client. That’s another significant thing: celebrating the commissioners, the people who are setting the briefs, and celebrating if they create good context for a good project. So it's not just us as the practitioner delivering something just because we're given the fee. As your projects are often temporary, do you try to maintain the effects of a project after it’s completed? That is the massive question we're asking ourselves! When we start a project, we try to figure out whether it’s going to be just a theatrical moment; or, if it’s our intention to make it last, then how are we going to make this last a long time? I think the physical installation is important, because obviously you want to create a structure that has longevity. It's number one. But it's also about the partnerships - figuring out how you make those stronger. You make sure that you work with people who do have a long-term investment in that place. It’s interesting - I read an article in the Financial Times recently which describes this concept of ‘Anywhere People’ and ‘Somewhere People.' Anywhere People are quite free, and move around, and have gone to a lot of different places; but Somewhere People are much more connected to place. They've stayed in one place; they haven't travelled far. Actually, we need to be thinking about these Somewhere People, because those connections are what make places. On a personal level, we’ve worked in lots of different places around London and Europe. It’s about that figure of eight loop where your energy goes out and it comes back. It makes you think, "My God, where's my energy going? What's the investment?" I sometimes ask myself, "What's the 30 year project?" Where's that long-term investment?” For me, I'll probably be thinking more towards Ireland in about five years. I think we all have ingredients of both Anywhere People and Somewhere People in us. It's important to be able to go off, gather information and learn. But I can say to myself now: I'm getting to that age where I want to go back. As The Decorators matures and evolves, are you changing your working process? We’re trying to have less projects with longer commissions. It’s ensuring that we survive as a business while still retaining the intention of the work that we want to do. That all feeds back into getting the right partners and making sure that there's a legacy for the project. We’re constantly refining - it's a process of designing the right questions. It’s also what you should be doing with all your friends and family: finding the time and using old rituals, going back to the restaurant or going back to radio, and playing with those modes of what makes people feel comfortable. Compassion and meditative practices are also important. Even in the studio, we've got a weekly practice of reflecting on the week. We have a few questions that we ask ourselves and then we share them with each other at the meeting. It’s also worth remembering there's no right answer. Certainly you mature as a practice over time but you’ve just got to trust in the process. I would like to experiment more in actually writing. There's another layer to your work where you're trying to teach other people what your practice is about. So I’d like to spend more time reading, researching and writing. Our work is also always about creating better experiences and better places for other stories to unfold. Creating those spaces for different people, who wouldn't normally interact, is important. That's the thing we're losing. We work with a lot of ‘older people’ projects, for instance - why is there this distinction between old and young? Our job didn’t exist 50 years ago because it didn’t need to. Communities used to self-organise. We all used to live in closer proximity to each other, and you’d meet on the doorstep or on the street. Now we’ve got apartment blocks where they are taking away even those shared balconies. Those moments throughout your day, where you bump into people, aren't happening as they did. We are having to come and redesign it back in. I think there’s a threshold that we have, where we can deal with a certain level of interaction, but when it’s just an explosion of interactivity, it's complex. The trick is how to create those little interactive moments in safe environments. It's in those moments where there might be an intersection between people who've never met before - a sharing of stories and wisdom. It’s honesty, isn't it? We're living our stories on a day-to-day basis. We're facing difficulties, we're getting through them, we're getting to new places. I think story is people being open-hearted about what they're experiencing. Market stall, hairdresser, radio station, dinner table — a well-loved physical frame acts as a ‘Trojan Horse’ that breaks down the barrier to a conversation with community, and walks right into the regular rituals that make people feel comfortable. Don't rush it! Take the time to figure out what's right for a certain place and context. What spaces of exchange do people congregate in? What are local rules of engagement, from a nod of recognition at the market stall to a neighborhood boxing match? Once you've drawn people in, it's ok to play with those parameters, but make sure the community are cool on the rules so they understand the expectations and interactions with the space you’ve created. There’s a tendency to forget the aesthetic when engaging communities to avoid over-branding. But decoration can create a physical ‘stage’ to open up stories and imagination. Use it well and it piques curiosity and creates playful frameworks. Psychologists are your go-to in terms of uncovering individual identities, but what represents collective? Again a physical space can hold these individual stories together and reveal community identities, from an afro-caribbean barber shop, to a radio station.